Desert Mountain is the perfect choice for those seeking an affordable home in a top-tier community. There is a good selection of luxury homes priced from $500,000-750,000. Homes range from golf villas and charming cottages, to custom detached homes. Experience a resort-lifestyle with endless recreation and the camaraderie of a private club. Desert Mountain features a wide range of amenities, from a leading-edge fitness center and spa, to an impressive collection of six Jack Nicklaus golf courses. To schedule a showing of homes, call Carmen Brodeur at (602) 791-0536 or email Carmen@TopScottsdaleHomes.com. Desert Mountain is an award-winning golf community best known for its six championship golf courses, all designed by Jack Nicklaus. With the largest collection of Signature Jack Nicklaus courses worldwide, it is no wonder that Desert Mountain draws so many avid golfers to its cactus-lined fairways. A true desert oasis, Desert Mountain offers mind-blowing panoramic views of the Sonoran landscape that can be enjoyed from the course or your own backyard. The community’s dramatic surroundings are the perfect complement to a stunning selection of luxury homes, designed for the discerning homebuyer. Desert Mountain offers numerous real estate options, from sprawling golf villas to charming patio homes. Find a home that fits your personality and preferences in one of Desert Mountain’s close-knit villages. Desert Mountain is a luxury seeker’s paradise. Its array of spectacular amenities range from gourmet restaurants to scenic hiking trails. Dine at one of six uniquely designed clubhouse facilities or spend an afternoon at the world-class fitness center and spa. Desert Mountain is also home to a state-of-the-art tennis complex with 9 tennis courts, as well as two resort swimming pools, a Youth Activities Center and more. 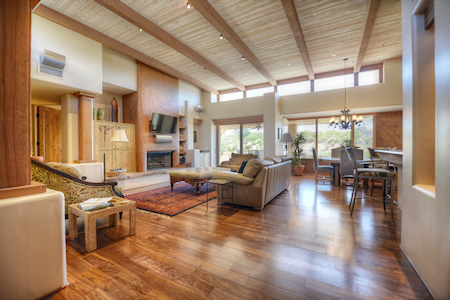 Desert Mountain homes are known for their unrivaled luxury. A haven for the truly elite, this exceptional golf community boasts the finest custom and semi-custom homes and the most coveted golf properties. The most extravagant homes in Desert Mountain can reach prices well into the millions. However, there is no shortage of more affordable Desert Mountain real estate. To begin your search for Desert Mountain homes for sale, contact Carmen Brodeur. Carmen would be happy to schedule a showing of homes with you or answer any questions you have about Scottsdale real estate. You can reach us at (602) 791-0536 or at Carmen@TopScottsdaleHomes.com.